Start your own adventures with the amazing 10'4" x 6" Adventurer 2 iSUP. Better looking, plus smarter design... and at an almost unbelievable price because we sell it direct! 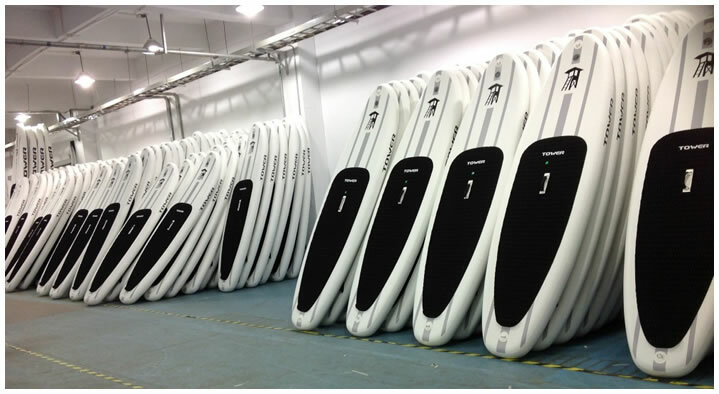 Tower's "Adventurer 2" is the sequel to one of the most popular inflatable paddle boards worldwide (the Tower Adventurer). It's a little longer so it floats a little more weight and goes a little faster. It also adds an extra handle on the nose and tail for easy carrying, as well as a cargo net upfront for securing a load while paddling. Note: This is the board only. Does NOT include a pump or paddle. Includes a 10'4" by 32" by 6" inflatable SUP, a high-end Tower branded diamond grooved deck pad, a 2+1 fin configuration with a removable center fin, a hand hold strap, a roll-up carrying strap, a cargo net, a front and rear handle, and a leash attachment ring on the tail. Frankly, virtually all 4" inflatable SUPs (which is pretty much all inflatable SUPs on the market) leave a lot to be desired. That's putting it nicely. They sag in the middle and ride low in the water so you end up standing in a puddle of cold water, which is miserable. The sagging and undulating ride also slows you down. The 6" thick, military grade Tower Adventurer 2 Inflatable SUP is dramatically more rigid, plus it floats higher in the water so no wet feet. But this is only one of many advances that set the Tower Adventurer 2 Inflatable SUP apart from the competition. The Tower Adventurer 2 Inflatable SUP is made from extremely rugged materials like those you'd find on the highly regarded Zodiac boats and extreme river rafts. The amazing rigidity in the Adventurer 2 is created by thousands of vertically oriented strands of identical length that connect the top deck to the bottom. When inflated, they form a structure that has the rigidity of a piece of plywood, and the thicker you go the exponentially more rigid it gets. You'll be amazed. We can literally put the front tip of the 10'4" x 6" Tower Adventurer 2 on one chair and the rear tip on another chair and a 200 lb person can stand in the middle and you can barely see the thing flex. Do this with most 4" inflatable SUPs and they will taco almost to the floor. Even 3/4" plywood flooring would probably break over this almost 10' span. Amazing Rigidity A Viable EPS/Epoxy Board Alternative - We're not kidding! Traditionally, inflatable SUPs were only a consideration for traveling - store one in the cuddy cabin on your yacht, take it with you on the plane, or haul it into that secret mountain lake or river and you can stand up paddle board in the farthest corners of the earth. With the rigidity of the Tower Adventurer 2, an inflatable SUP is now also a viable EPS/Epoxy board alternative for anyone who isn't a die-hard surfer. Easier to store - When rolled up, it's 1 foot in diameter and 33" wide. Easier to transport - No need for roof racks. About the size of a rolled sleeping bag, it easily fits in any car or boat, can be checked on a plane, and can even be strapped onto a bicycle or motorcycle. Poorly designed detachable fins that frequently fall off during use. Cheap bags that are "bundled in", yet you'll never use. A simple strap works fine. A seriously annoying sagging issue which leads to wet feet. Cheapest available, uncomfortable traction pads. At 4" thick, not suitable floatation-wise for heavier paddlers. Questionably designed inflation pumps that come apart. Pressure gauges that are not integrated into the pump, so you have to pump, detach, check inflation, pump, detach, check, etc. Lack of a surf leash attachment. Dynamite paddle board. This is absolutely an all-around board that is very well engineered. As well, it is well contructed, heavy duty materials, and is well appointed (e.g. carry handles, cargo bungee, d-rings, etc.). This is the real deal folks, definitely not a pool toy. Additionally, it tracks pretty well, maneuvers as well as any board, and is not bad with speed. The board has plenty of volume and is super stable. I am 6’ and 200 lbs. No issue finding a sweet spot. As for firmness, it is rock solid. First time out, glided effortlessly for 3 hours. Lake Erie with light wind and chop. Sure boats will rock you a bit, but other than that, smooth paddling. I do, and alway recon recommend upgrading to a lighter paddle that is suited to you strength, height and skill level. I prefer a fixed all carbon paddle with a large paddle surface. Love the speed and the workout. Ok, here is the cool part. I was able to inflate this board to 15psi in 4 minutes. I was going at a pretty good kilp, but I like the exercise. The electric pump took the about the same, but with zero effort. The only thing to keep in mind is strong winds and a high center of gravity. Because of my height and being too heavy, winds are sometime dehumanizing. Before you exhaust yourself, simply drop to your knees and paddle on. That aside, I nothing negative to say about this board. The big take away is that this is an outstanding board for $465.00. I actually picked mine up for $365.00 with a coupon that was sent to me by Tower. I opted for the board only, as I have multiples of pumps and paddles. This has become my go to board for after work cruising. Weather permitting, this board gets used 3 to 4 times a week for few hours each time. In closing, I can not stress this enough. Always wears PFD, you life is worth it. If you are a good swimmer and not into vests, simply wear a waste PFD. The water is awesome, but always respect its power. On a side note, if you are looking for more speed, take a look at the 14’ Xplorer by Tower. If this board is anywhere near the same quality, it will be a screamer. This will likely be my next board. Happy trails. Super happy with this board so far. Has proved durable and I'm not easy on any of my gear or equipment. Handles well, easy to inflate, store, the bungee is great for bringing along extra items. Sturdy also, not feeling like you're standing on something cheap. Love it! Love the product and the customer service I received. Great product, very sturdy, easy to use! I love it! Fits my dog and myself and a cooler full of beer. What more could you ask for!? The Tower Adventurer 2 is the best inflatable board I have used. The higher capacity is great and the board is very stable. It is very durable and rolls up to be as small as my smaller inflatables. Well worth the money if you want a board that will last. I had tried a Friends Tower inflatable board once and was sold. I opted to buy the board by itself, and the electric pump separately and highly recommend that to everyone interested in the convenience of an inflatable board. This inflatable board has the rigidity of a regular board, but the convenience of being stored in your trunk and ready to be in the water in less than 10 mins. I also love the capacity of the board, you can have 2 adults on it easily or toss a couple of kids on it and still be well above the water level. I have been using this board every weekend since I've gotten it. Pros: It is sturdy and handles small waves well (I haven't been in any big waves to report on them). I can jump on this board when it's in the water, and there is some give, but nothing that's thrown me off of it. My two small dogs walk all around it while I'm out on the lake, and it has not affect on my ability to navigate the board - really great. Cons: While I am so appreciative of the addition of the bungee in front, it's tied off in a knot (I know this is common). I would have liked to see some heat shrink tubing on the ends and may still do it myself. There has not been any fraying on the ends - just a clean look preference. I purchased the board only and I’m pretty much satisfied with it. Only thing that is bothering me since I only used it once is the seam by the fin is already starting to come apart. I don’t know if the repair kit that comes with the board should have the adhesive with it but mine only came with the valve tool and patches. Bought this board for my 12 year old granddaughter to use on my pond. She has gotten many hours of fun, and has not been gentle about it. Just bought a second one! This is a very responsive and fast board. I bought it primarily for river runs and she was great and out performed my other 2 boards. Handled the rapids well and all of my friends couldn't keep up! theirs out first. They used theirs on the river and the lake, the boards did great on both! Purchased this for my wife because she kept stealing mine. She has two hard boards, but these are so easy to travel with she prefers it for most days. My last one is 3 years old without an issue. I hope to get a lot of use out of the two. This board is amazing. Super stable and easy to maneuver in the water. Ended up having to purchase my husband a tower board too because he kept stealing mine! First iSUP: really like it. I'm new to SUP so take my feedback FWIW. I bought this based on search results for "top iSUP". Several SUP blogs or sites had the adventurer 2 as a top pick and it's got really good ratings on Amazon. We just took them out for the first time this weekend onto a small lake in Oregon, and the overall experience was great. It seems very stable, even in windy/choppy conditions on the lake. They seem built very well, high quality materials; cleans easy. Wide and stable. I originally was looking at tower boards while living on the coast for an all around surf paddle board. Moving from the South East coast to the Rocky Mountains, I was converted to an inflatable board for practical purposes. A great board I could use in lakes, rivers, and the ocean. I was especially surprised how small the tower board rolls up for transportation. My 60lb Belgian Malinois and I both float nicely above the water. I feel reasonably stable with my dog rushing from one side of the board to the other chopping at the smallest splashes and diving off chasing his frisbee. Awesome board that is definitely quality. Very stable and attractive as well. Adventurer 2 isup board only 10'4"
Family on all week at the lake one week after receiving it. Can't wait to keep using. I sold my 11'4 hard SUP for something more convenient to travel with. This iSUP is perfect for what we were looking for! Pumping it up with the manual pump took me about 6-8 minutes. After getting to about 10 PSI, it was extremely hard for me (5'3, 110 lbs) to get it to the recommended PSI. My husband had no trouble with it at all.I will likely purchase an electric pump so I can pump it by myself without tiring myself out. It is a little awkward to carry the board when it's deflated, so I definitely recommend getting the backpack with the board if you're walking any distance. My only reason for the 4 stars is because the middle handle on the board broke our first time using it. The velcro came undone and will fasten back to some degree, but after picking up the board by the handle, it breaks again. Over all, we love the board and are really happy with our purchase! Just need some repair for the handle. Thanks Tower! My wife and I are first timers and easily got the hang of it. The first time out was a little shaky but we quickly gained confidence. Haven't fallen off yet on 5 1.5 mile trips but expect to some day. Very happy with purchase. i only purchased the board. Nice price for the quality. holds my 200+ lbs easily. don't want to go straight but a Great cruiser for the open water..